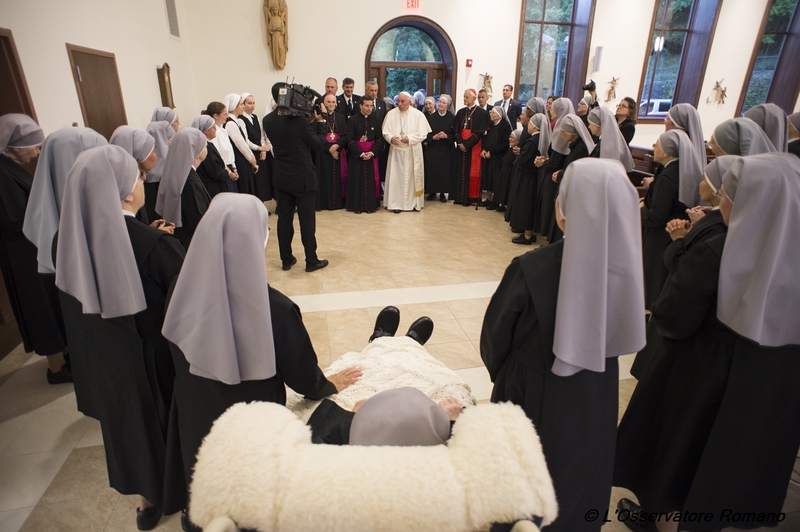 Pope Francis made an unscheduled visit to the convent of the Little Sisters of the Poor, the religious women who are involved in a lawsuit against the Affordable Healthcare Act’s contraception and sterilization mandate. According to Vatican Radio, the Holy Father visited them shortly after presiding over the Canonization Mass of St. Junipero Serra at the Basilica of the National Shrine of the Immaculate Conception. While the mandate of the Affordable Healthcare Act says that the religious-affiliated organizations do not have to provide contraception, they do have to sign a form that states their objection, causing insurers to provide separate coverage. In their lawsuit, the Little Sisters of the Poor state their objection to signing the form and thus indirectly participating in the wrong. “In this sense it is connected also to the words that the Pope has said in support of the Bishops of the United States in the speech to President Obama,” he said. The Little Sisters are dedicated to caring for the elderly poor.